Little Women was read as part of the TBR Pile Challenge 2014 and The Rory List. Following the lives of four sisters on a journey out of adolescence, Louisa May Alcott’s Little Women explores the difficulties associated with gender roles in a Post-Civil War America. Lots of people love Little Women, don’t they? I think maybe I read it at the wrong time. I should have read it when I was younger maybe. I can see myself liking it around he time I read A Little Princess, and The Secret Garden, and all the Noel Streatfield books. It has a similar tone. As an adult though, I didn’t like it so much. It struck me as being a little preachy to be honest. I get the idea of good role models and having a moral story- it’s even addressed within the book, however it’s almost too perfect, even as they have their own struggles with things they find hard the girls never really seem to need redeeming. The characters were too set in their ways. The idea of Beth always being perfect, and Amy always a little vain, and Jo with her boys. There was no real depth there a lot of the time. Looking at Alcott’s life it seems that it is very much based on herself and her sisters (her being Jo, of course). Maybe this is why Jo seemed like the most defined character, because Alcott could see into her own head, but not into that of her sisters. 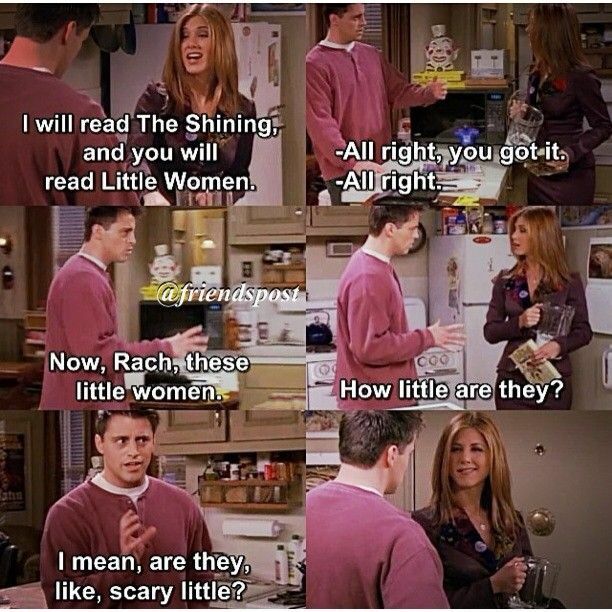 Whenever I think about this book I think about the episode of Friends where Joey and Rachel read each others favourite books, Rachel’s being Little Women, and Joey’s habit of hiding books in the freezer. It’s funny that I liked it so much when I re-read it, in fact I almost expected not to. Because you are right it is very preachy. I must have just been in the right frame of mind for it, because that kind of preachy tone usually irritates me. I think I just love Jo so much that I forgave the preaching. I read the book at the start of the year and while I enjoyed it, I also felt it was mostly about Jo. Although, I guess you could say Amy changes a bit during the story too. I kept in mind that it was written for young girls and then some of the preachiness wasn’t too bad.